Detecting the signs of hearing loss in your child as early as possible significantly reduces the effects of long-term damage. Mild or partial hearing loss that is detected by the time a baby is three months old is the best case scenario regarding treatment options and the overall well-being of a child. In the first few years of life, hearing is a critical part of a kids’ social, emotional, and cognitive development. Mild or partial hearing loss, while not as severe as total hearing loss, still has a large effect on a child’s ability to speak and comprehend language. The symptoms of hearing loss can most easily be seen by watching for signs that hearing is normal during several hearing milestones your child should reach in the first year of life. Hearing screenings are performed quite early in an infant’s life to detect babies born with hearing loss. However, some infants are born with perfectly normal hearing and later develop hearing loss due to infections, trauma, and damaging noise levels. Therefore, it’s important to have your child’s hearing evaluated early and often as they grow. Infants should have their hearing evaluated before leaving the hospital. The Early Hearing Detection and Intervention (EHDI) program identifies every child before the age of three months born with a permanent hearing loss and provide intervention services before six months of age. It is of extreme importance to have your baby undergo a hearing screening within the first three weeks of life. 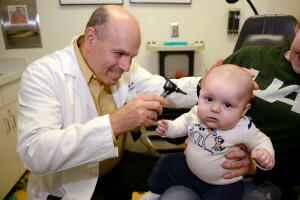 In some cases, babies do not pass the initial hearing screening. However, this doesn’t necessarily mean that your child has hearing loss. Rather, debris or fluid within the ear may be interfering with the test. In this case the test is typically redone until a proper diagnosis can be confirmed. If normal hearing is found within your infant then hearing should continue to be regularly evaluated. Typically hearing tests should occur at ages four, five, six, eight, 10, 12, 15, and 18. If you are concerned about your infant or child’s hearing it’s important to see a doctor as soon as possible. Contact child ent specialist today either online or by calling (205) 831-0101 to find out more about how to prevent and repair hearing loss in your child.